Club Penguin Cheats by Mimo777 Club Penguin Cheats by Mimo777: Club Penguin Draw Coats For Kids! Remember when Happy77 said Billybob would have an art project for us this week? Well, Club Penguin is joining ABC's Good Morning America (Disney is their parent company, too) with their 5th Annual "Warm Coat and Warm Hearts" coat drive. How can we help that, you ask? Well, in order to "raise awareness" of the coat drive, Club Penguin wants us to "Draw Coats for Kids." Step 1. Draw a picture of your penguin wearing a coat. Click here to learn how! Step 2. Submit your drawing here. Step 3. Be sure to check out the What's New Blog, Fan Gallery and Art Gallery in the Book Room to see some of the submissions. 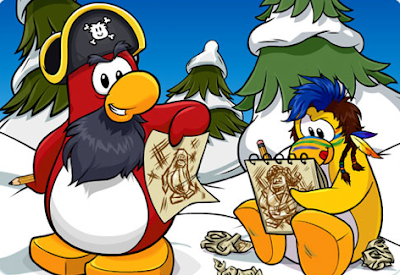 But, the coolest part about this coat drive, is that some of the drawing will be shown on Good Morning America on December 2nd AND, if we submit at least 100,000 drawings, Rockhopper will appear in Time Square in New York on Good Morning America! Super saweet! I can't wait to hear if you submit a drawing and especially if yours makes it on television! So, get drawing! !